Rules are important for every sport. Please take the time to know the rules of the hunt. If at all possible, don't ride a kicking horse. If you have ever seen a horse with a broken leg due to a kicker you will never forget it. 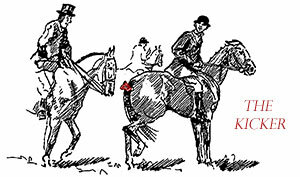 If you find yourself on a kicker, it is imperative that you tie a bright red ribbon near the root of the horse's tail, as a warning to others, and ride at the very back of the field. Control your horse. Don't run into other members of the field. It is discourteous, to say nothing of being rather painful. If you have an unruly horse, get rid of him, as there will be no pleasure for yourself, or for anyone else, if you cannot keep your horse in hand. Don't crowd at fences. Give the person in front of you at least a hundred foot lead, so if horse and rider should go down, you will not jump on them. If your horse refuses a jump you must circle and go to the end of the line. Don't talk while hounds are casting about for the line. Your entire interest is supposed to be centered on the working of the hounds. Be on time. A hunt must be conducted on schedule, and no greater discourtesy can be shown the Master, and to the Hunt itself, than to straggle in with no regard for the time of moving-off as shown on the fixture card. Plan to arrive at the Meet 45 minutes prior to moving off time and be mounted 15 minutes prior to moving off. Don't fail to give a hound room. To run down a hound is well nigh unpardonable. Hounds are hard to train, expensive to keep going and do their best to give you good sport. Since many horses kick at hounds, do not fail to give hounds a wide berth. If hounds or the hunt staff is passing you keep the head of your horse turned toward them. Do not berate, cheer on or talk to a hound that is for the Huntsman. If someone comes down, don't keep on going; pull up promptly, help him remount and assist him in every way possible. This same thing may happen to you the next time out. If hounds are gone away on the line of a fox, and by chance you should see the fox back-tracking, don't get "buck fever". Pull up and shout "Tally-ho" at the top of your voice, pointing with your hat or cap in the direction that the fox has gone. Don't gallop over the line of scent - stay still until the hounds are brought up and capped on the line. Please return all gates to open/close status that the first rider found them in, if in doubt ask the Huntsman or Fieldmaster, or close them. Be of assistance to your Hunt. Do not simply take everything for granted. A hunt is difficult to maintain, even under the most ideal circumstances. Without your individual interest and assistance it will not prosper as it otherwise should. Ascertain if there is not some burden that you can take off the shoulders of the Hunt officials. Consistently manifest a practical willingness to assume responsibility, if and when requested. Above all, show your pride in your Hunt and your respect for the Master, by hunting regularly, at all times with your attire, your horse and your tack in scrupulously correct and clean condition. Subscribers and guests of this Hunt should make it an invariable rule never to rider over a farmer's land, save when out with the hounds when due permission has been sought and given. Never to ride over land that is wet or in crops, never to ride through a barnyard or through cattle at speed, this is a certain way to shut off amicable relations. By contrast, make it a point to have a pleasant word with the landowner, or his family, and always raise your hand. Simply and sincerely, make them feel that you are appreciative of their great courtesy in permitting the Hunt to ride through their property. 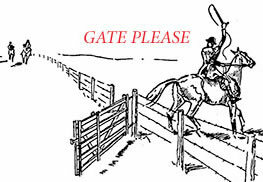 If the Hunt should knock down a fence or open a gate, regard it as your immediate duty to remedy the situation at once. One of the quickest ways to close a good hunting district is to allow a farmer's livestock to get out become injured or lost.